During my visit to Tokyo, I spent a day exploring Akihabara, the mecha for otakus, anime fans, idol fans, computer nerds, and, of course, maid and cosplay cafes. I visited Akihabara with the intention of hunting down some rare manga merch (mission: failed) and locating some lithium AA batteries for my camera (mission: success! ), and had been a bit unsure about what to do for lunch that day, as I was totally on my own, and a bit nervous about going to a maid cafe by myself. But then I thought to myself, “When will I have another opportunity to go to an Akihabara Maid Cafe?” YOLO and all that. And so, I resolved to find a cute cafe to have lunch in. It was actually a little more difficult than I first anticipated. There was a maid cafe I’d spotted earlier that seemed interesting, but though I could see the sign on the upper floor of a building, I couldn’t find the entrance! It would seem that a lot of these sorts of buildings need to be accessed from the back, using the elevators there. So, what ended up happening is I ran into a maid promoting the Heart of Hearts cafe on the street and I asked her about it and how much a lunch set would be. 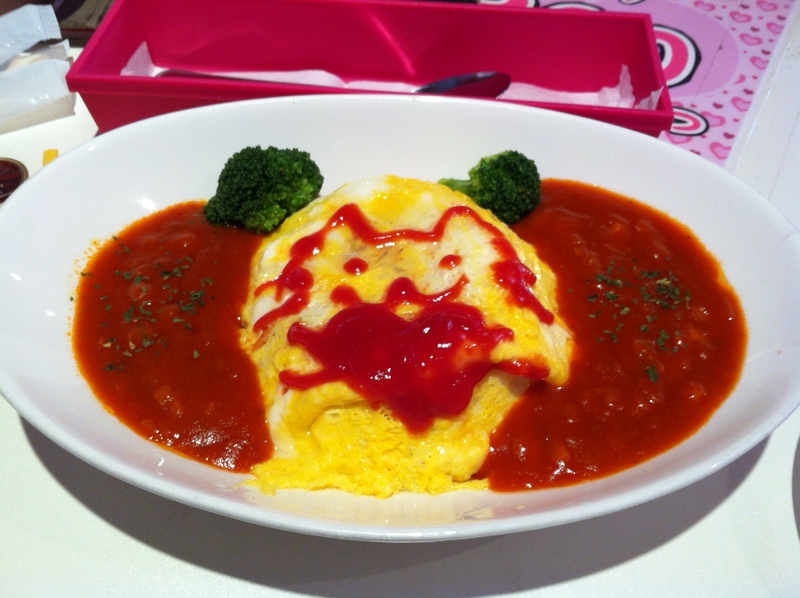 Maid cafes and other similarly themed restaurants tend to be rather expensive. Although the food is usually not much more than simple, easy-to-make dishes, because you are paying for a unique, cute experience, the prices are higher. The Heart of Hearts lunch set was apparently 2500 yen (about $25 US), and includes a drink, lunch meal, a dessert, plus a picture with a maid of your choice. I think they may have given me a discount, though–I only ended up paying 2100 yen. Apple pie! Which was also quite good, and they drew a chocolate cat on the plate. Like I said, you’re paying for cuteness, not quality or quantity. After I ate my pie and took a photo with Nyankichi (which was the opening photo for this post), I thought that meant it was time for me to leave, so I sort of started to gather my things. But Nyankichi came over and was like, “Eh? You’re leaving now?” At the beginning, as part of my “education,” they told me that I had one hour, which I assumed meant that I had to leave before the hour was up. Apparently, not so. You are allowed to stay and hang out, chatting a bit with the maids until your hour is up, even if you’ve already finished your meal. All in all, it was a good time. I would never make a habit of frequenting these cafes, since, like I said, they’re a bit pricey. But they’re very cute and it’s definitely a unique Japan experience that I would recommend to anyone who wants to try. If anyone is interested, you can find the Heart of Hearts website HERE. 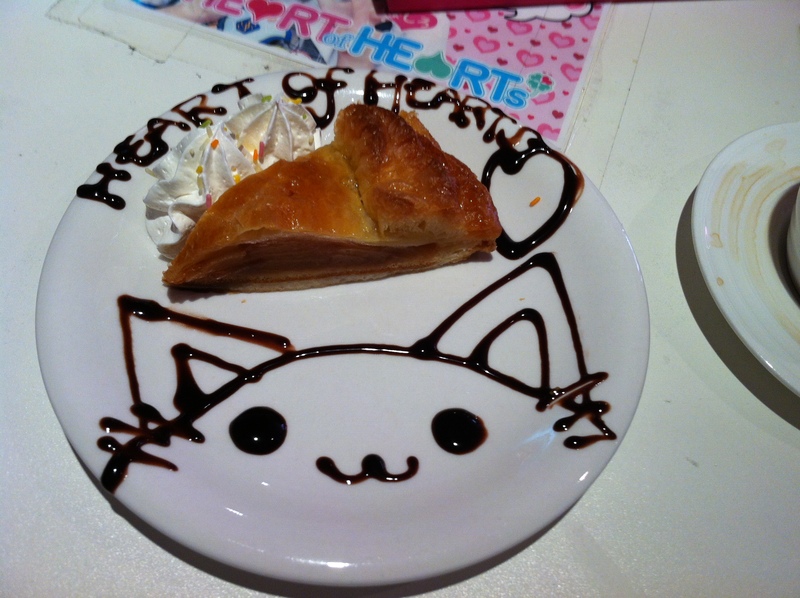 This entry was posted in Uncategorized and tagged Akihabara, Heart of Hearts, Japan, Maid Cafe, Tokyo. Bookmark the permalink. Thank you! Yes, maid cafes are so unique, they’re definitely worth trying at least once, even if they’re expensive. 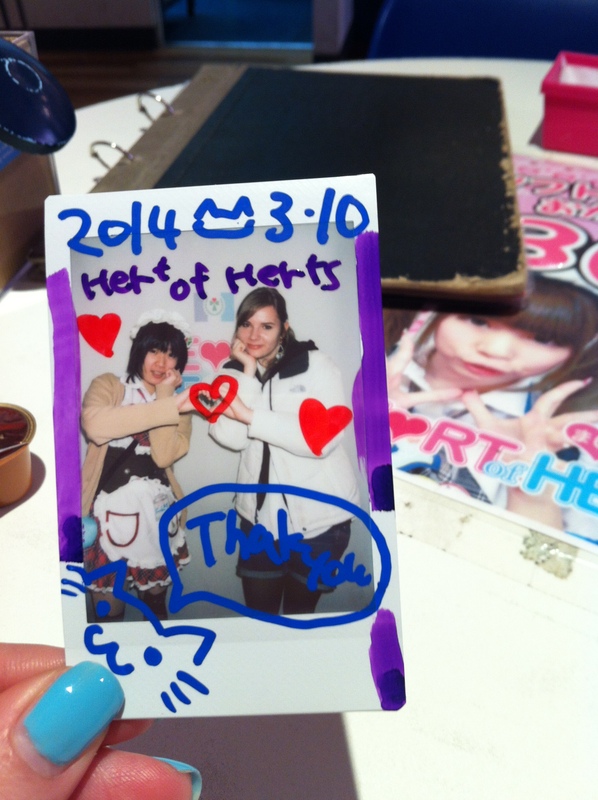 ^^ I hope you had fun at the cafe you went to!